5 Free Online OCR Software to Convert Image to Text - 5FOUND ! OCR is short for Optical Character Recognition and an OCR tool will extract text from images and convert them into a format so that you can edit or use. Below are five free online OCR tool that will help you convert images to text. This tool from free-ocr.com allows you to extract text from any image,including JPG, GIF, TIFF, BMP or PDF. The tool can handle images with multiple columns and supports up to 29 languages, mostly languages of Latin origin, and eastern languages like Chinese, Korean, Arabic are not supported. 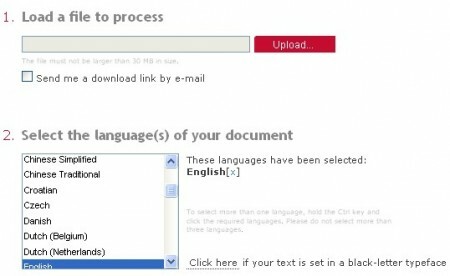 The tool is easy to use, you just upload an image and then select the target language then hit “Send File” to get your converted text. A few limitations are your uploaded image can not be larger than 2MB and for PDF files with more than one page. It will only convert the first page. 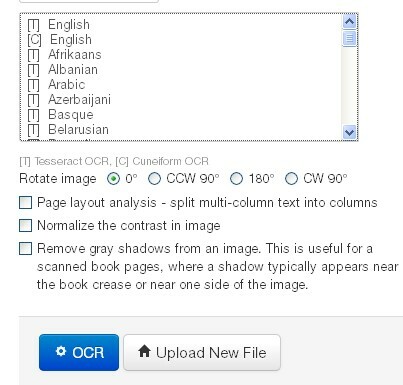 Free-Online-OCR.com allows you to convert scanned images into editable text. You can upload files in the format of PDF, GIF, BMP, JPEG, TIFF and PNG and output it as DOC, PDF, TXT or RTF. Onlineocr.net allows you to extract text from images in JPG, JPEG, BMP, TIFF and GIF and then output the files in WORD, TEXT, EXCEL, PDF and HTML formats. The tables, columns and graphics in the original files will be converted so it will look like the original ones. It also supports most languages of Latin origin and it allows you to upload images up to 4 MB. Newocr.com is another tool that allows you to convert files in JPEG, PNG, GIF, BMP, TIFF, PDF AND DjVu to text. It does show a very large range of languages for you to convert including Chinese, Arabic, Japanese etc, but after a few tests, it is still unable to recognize exotic scripts other than Latin. But it does offer a few unique features that are not seen in similar tools, for example, it allows you to rotate images, remove gray shadows on an image so it get more accurate results. This tool from abbyyonline.com seems to be the most powerful one among the five. It allows input and output file formats of a very large range. In addition, it also allows you to upload images up to 30MB. Most importantly, based on our tests, it works for other non Latin scripts like Chinese, Arabic Thai etc, though the results are not very accurate, but still desirable. Just to mention, the service requires you register an account and confirm your email address and if you want to convert more than 3 pages, you will need to buy pages.